I started my day as usual doing research, reading and writing at Caffe Nero and later at the Beach Terrace Cafe which has received a social media makeover. Everywhere I looked there were posters and banners promoting their new Facebook presence, encouraging me to Like their Facebook page, upload pictures or review the cafe on Trip Advisor. It was extremely tacky and I can’t imagine that it will go down well with many of their regulars. I hope by the time I get back 90% of the posters will have been pulled down leaving only the gentlest of reminders Facebook has reached my sanctuary. After doing a quick clean up at home Steph and I drove over to Filey. We had a great conversation about her upcoming trips to China and Japan, most of it focussed on food and the fact that I would starve if I had to visit, the more Steph talked about the diet the more real that prospect became for me. I definitely won’t be going to Asia! Jesus and his disciples shared their food and in doing so inspired the others in the crowd to share theirs. The result being there was enough food for everyone to eat. This is as important a message today as it was then. There would be no food poverty in the world today if the west stopped wasting and over-consuming, there’s enough food it we share. Apparently some people still believe the story is literally true. We also talked a lot about Buddhism and it’s central philosophy that attachment is at the root of suffering. Freed of our attachments and able to live in the moment we become like the dog running in the surf or the child playing in the sand. We arrived at Filey at about 15:00 after stocking up on a superb basket of healthy foods and checked into the excellent caravan. I’m constantly amazed at how at home I feel in caravans, and how relaxed. I think it’s because the ratio between stuff and space is so low. I feel like I’m living in Simple Life magazine for a week. That feeling of simple living is further emphasised by the wide open beaches, the wonderful views and the sleepy, but beautiful Filey town. Consistent with the simplicity theme I ran out of podcasts to listen to and was thrilled to remember that I’d downloaded Fool’s Errand, the first book in The Tawny Man Trilogy. This is another masterpiece by Robin Hobb and it’s going to be such a treat to listen to it this week. This first day has been a bit tiring with the travel and a little misty when we arrived, but it’s been relaxing and memorable as well. 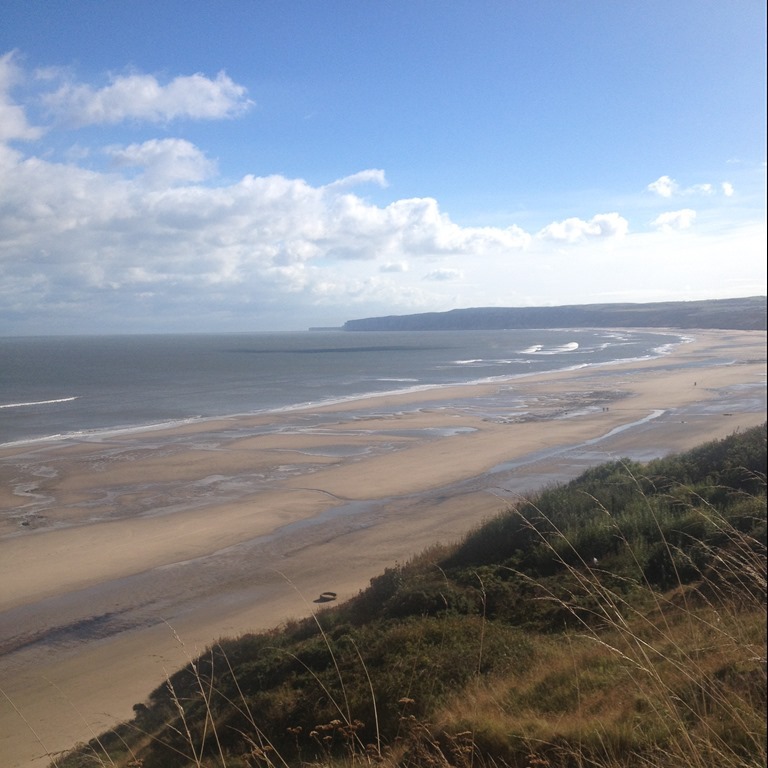 The picture is of Filey Bay in all it’s glory. I’m looking forward to watching the sunrise tomorrow, with the beach to myself and a few hardy dog walkers!